Last week we wrote about the influence of mobile marketing and how it’s influencing real estate buying. We must have touched a nerve because the last portion of the story was about a new mobile app and several people emailed asking for the link for this free tech tool. Mobile Apps For Real Estate! Because there was so much interest, we decided to do a follow-up and concentrate solely on this new app. Unlike other apps like Zillow, Trulia, Homes.com, Realtor.com, the RE/MAX app doesn’t sell advertising opportunities per zip code to agents from various companies, so there isn’t pressure from agents trying to convert an advertising opportunity. 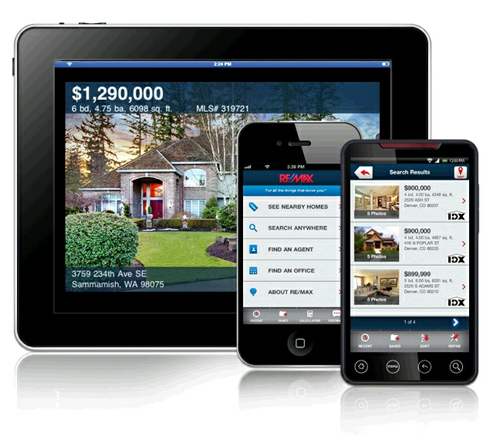 The RE/MAX app simply puts detailed information in the hands of the consumer and lets the consumer make choices. Most apps let the consumer decide when to request information, but RE/MAX isn’t selling consumer data to companies for profit. This app is solely a benefit to consumers provided by the RE/MAX network, and any consumer info is available only to RE/MAX agents when a consumer decides to reach out and request information. There are some very cool things you can do with this app. For instance, if you have your GPS on, the app will show where you are on a map and show homes on the market in your area. Users can also enter search criteria such as number of bedrooms, price, location, etc. The app provides instant access to homes in your search along with listing details and available photos. It also provides turn by turn directions to homes you want to see, interactive maps for navigating neighborhoods, and the ability to save searches. There is an email option to share properties with your friends and family. There’s even an integrated mortgage calculator for instant calculations on how much the payments would be. Sellers love the app because they can find out how their neighbors are pricing their homes. If a new home comes on the market, a seller can just look it up instantly. Buyers love it because as they’re driving around they have the power of knowing the price of each home, the details of the home, and pictures right in the palm of their hand. For years buyers would call about homes they were in front of and be totally surprised at prices in a neighborhood. This free tool is a powerful education technology that will save buyers much time. Buyers still seek out quality, professional agents to answer their specific questions the Internet cannot, but this piece of technology sure empowers the consumer and shortens the learning curve. Judging by the interest last week, we think you’ll like this tool as well. And best of all it’s Free. Simply email me Brett@topagent.com and I’ll send you the link to get this tool for Free. Good luck and happy surfing! We’re seeing another shift in buying habits and it’s affecting everything from store coupons to selecting hotels to buying real estate. Yes, we’re talking about mobile marketing. Mobile Marketing Influencing Real Estate Buying. Years ago the Internet came along and everybody said newspapers and TV stations would no longer be needed. We found this wasn’t true; however the delivery methods have changed a bit since the advent of the Internet. Ironically now some are saying the Internet isn’t needed because everything is going mobile. I’ve seen reports that there is now more traffic to websites via smart phones than computers. While it is a fact more people have the power of information literally in their hand wherever they go, there is no substitute for wasting time at work on a big screen surfing the Internet, at least for now. The iPhone was a big player in bringing the mobile world to the consumer, but many would be surprised to know that Android is actually the bigger player today. 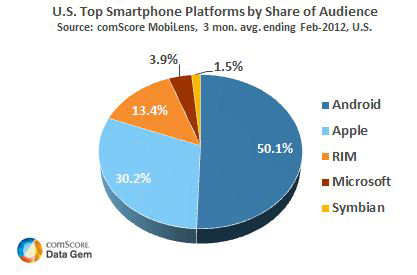 Android just crossed over the 50% mark in January of this year and market share is still growing. The only thing constant is change. Years ago Netscape was The browser in the industry. Microsoft managed to knock off Netscape with Internet Explorer. Now Google Chrome is making inroads along with Mozilla, Firefox, etc. Remember when Yahoo was the thing in search engines? Today it’s Google with Microsoft fighting for relevance with Bing. We don’t know what tomorrow will bring, however we do know what works today. 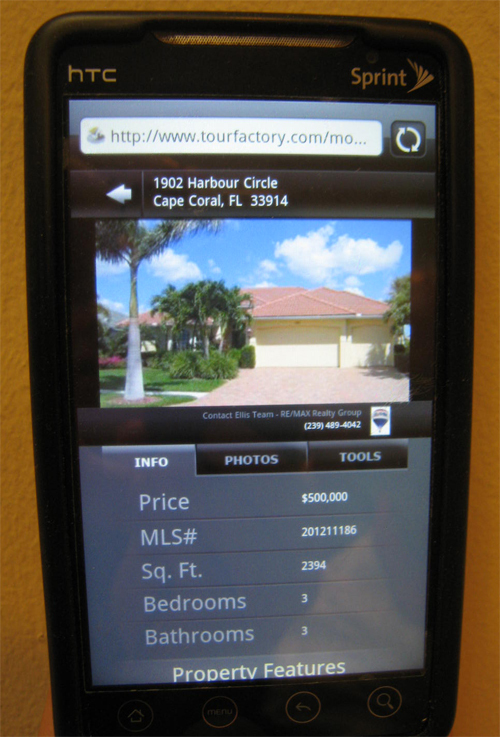 If you’re in real estate, you’d better design your website to work on a mobile phone. If you visit our website Topagent.com from a mobile device it recognizes the mobile device and gives you the option to view on a mobile optimized website. We’ve included a photo example of one of our virtual tours. All our virtual tours are optimized to play on any smart phone or phone capable of viewing the Internet. Of course we still have our full blown feature rich tours available for those old fashioned people viewing tours at work or home on a laptop. That sounds kind of weird talking about people on the Internet as old fashioned, but kind of fun I guess too. My how times are changing! The point is, if you want to be successful in business, you’ve got to be where the customers are. If a business employs old technologies, they’ll get diminished results and wonder why their leads are falling off. They’ll blame it on the Internet and say things like the Internet just doesn’t work anymore. We heard that about newspapers, yellow pages, and radio advertising in the past. They all still work, but customers buying habits are evolving, and if you want to maximize your success, it pays to find out what the consumers are doing and provide solutions. We have several websites. Even though Android is now king of the mobile market, we can tell you that the iPad is 74.76% of our mobile users on our Topagent.com site. These numbers change on various sites. As more tablets are released this year featuring Android, perhaps those numbers will change. The key is you have to know your market, design your marketing to work on the various technologies, and be available to answer customers in the fashion they like. If a customer calls you speaking English, they generally would like to speak to someone in English. If a customer calls speaking German, chances are German is their preferred language and they’d like to speak with someone that speaks German. The same is true with technology. Many people will contact you from their Smart phone. It doesn’t mean they’re ready to talk to you yet. If they ask you to email or send a text of a home, you’ll probably lose that buyer if you fax it to them because that’s more comfortable to you. If you want to pick up more German buyers, it might help to learn the German language. 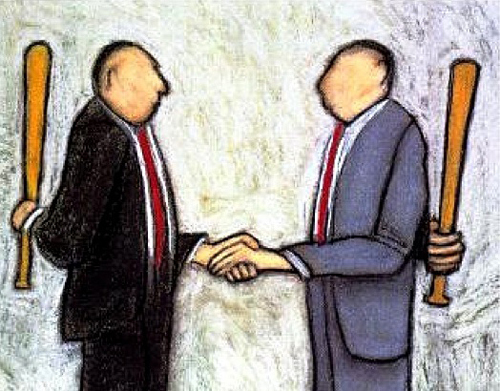 If you wish to pickup more buyers today, it might help to learn to speak their tech language. If a customer texts you, I’d respond with a text. If you’re not willing to learn the technologies customers want, the real estate industry will pass you by. But then again, so will most industries. If you don’t know what a QR code is, how to text, Twitter, Facebook, LinkedIn, Pinterest, provide virtual tours, syndicate your listings, do videos on the market, etc. you might be well served to visit Best Buy and look around at how they market with Bar scans, and what devices will read them. Watch customers compare prices the store is offering versus the Internet, and listen to how these devices are shaping buyers decisions. If you can see all this in half an hour at the electronics store, just imagine what is happening on the street in front of the home. If you look at the February and March 2012 graphs for single family home sales in Lee County, you’ll quickly notice that a large percentage of homes have sold for cash versus financing. This is not a new trend. 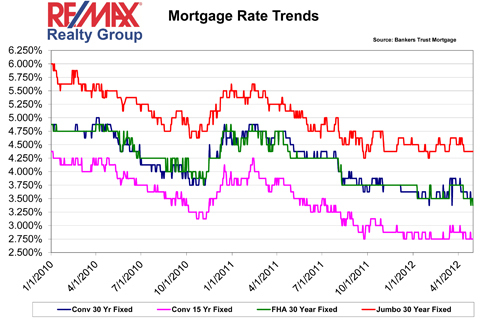 While cash sales have saved our market the last few years, it does have its good and bad points. And we’ll attempt to explain why we’re seeing so many cash sales as well. Cash Sales Dominate SW Florida Real Estate Market! You would think that with interest rates at historical lows, more people would be jumping on the train to buy now and finance. Homeownership is affordable, as rates are low and prices are low compared to the height of the market, although prices are on their way up. We believe price will go much higher if the government would get out of the way and make financing possible again. Local lenders are complaining, as are buyers, that the Dodd Frank Act has made it so difficult for qualified borrowers to actually produce unnecessary redundant and onerous documents that many just give up. Banks have gone from easy documentation loans in the boom to crazy stupid documentation now. We can’t just blame the lenders, because lenders are just following new provisions of the Dodd Frank Act. You might recognize the names, Chris Dodd and Barney Frank, two names synonymous with getting loans and perks from the banking industry maybe they shouldn’t have gotten. We’ll leave those scandals for another story. I’m sure you can read all about them over the Internet. In an attempt to regulate and improve the mortgage market, Dodd Frank has hurt the market in several ways. Parts of the act require higher down payments which will take many buyers out of the market. 2 recent studies suggest requiring all buyers to put at least 10% down would force about 40% of otherwise credit worthy buyers out of the market and requiring 20% down would force about 60% out. FHA has always required about 3-3.5% down and allows sellers to pay buyers closing costs, and their delinquency rates haven’t been substantially higher than banks requiring 10% down or more. Secondly, and speaking from personal experience, the documentation requirements banks are adding because they’re afraid of getting fined or having to buy back the mortgage are awful. We’ve had several buyers have to go back to the Social Security Administration and request newer social security cards because their older cards may not reflect a name change due to a divorce, marriage, etc. The number has stayed the same throughout their life, and the lender can see this, but they still require the new card which pushes back the closing. Because the closing gets pushed back, it generally requires all new bank statements and employment stubs. We’ve had lenders wait until next month’s stubs before they’ll loan the money, so both buyer and seller must wait. Wait, there’s more. Because a few fees might change due to the delays, like the interest rate lock may have expired, or the prorations could be off due to the delays, it required a new Truth in Lending Disclosure. You guessed it, if the lender has to re-disclose, there is a waiting period for that. That waiting period could trigger more bank statements, and updated pay stub, etc. It seems the cycle never ends, and it’s ridiculous. It’s no wonder listing agents want to know which bank is approving the buyer, and if the bank has a track record of delaying deals due to extemporaneous paperwork, it may cause the seller to accept another buyer’s offer over that one. Lenders are getting penalized under Dodd Frank, and they’re getting hammered by sellers and real estate agents who are looking at best offer and most likely to close on time, if at all. We feel that requiring higher down payments wouldn’t stop the market in a correction like the one we saw starting in 2006, so why add that on to borrowers who could never save that down payment while paying rent, preventing them from the American Dream? And even if you disagree with that statement, most would agree that Dodd Frank is preventing the market from moving higher because it’s essentially blocking access to capital markets for many. Don’t get me wrong, if you’re qualified, you can get a mortgage. You just have to know where to go to get the money, and be prepared to document everything just in case.